Watch full One Piece Season 15 Episode 45 English Dubbed full HD online. One Piece Episode 561 English Dubbed online for free in HD. Luffy tries to protect Shirahoshi along with her three brothers helping also against Hordy Jones as the New Fishman Pirate Captain is hell bent on killing the Mermaid Princess but seems to have an ulterior motive as Vander Decken IX is slowly losing focus, consciousness and his grip on the powers that he wields that keeps the massive ship Noah (after Decken’s near fatal injury from Hordy earlier) from falling towards Fishman Islands and is going to kill its occupants. 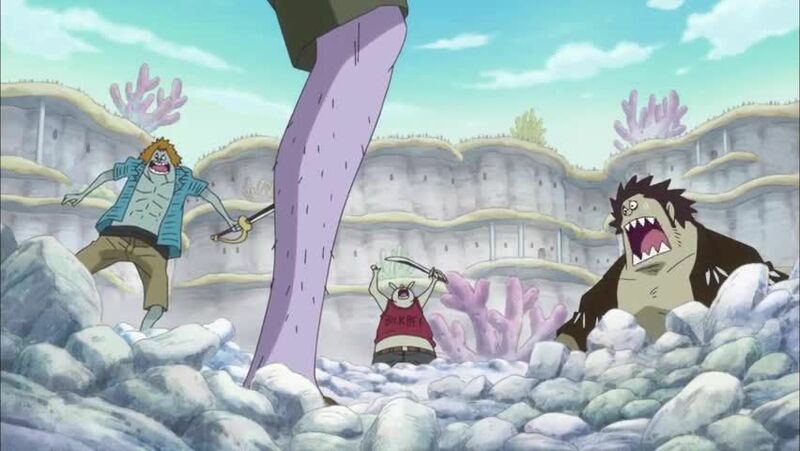 Meanwhile the other Straw Hats face off against the New Fishman Pirates officers who are equally eager to finish their opponents off as everyone prepares for the fight of their lives once again as the fate of the people of Fishman Island rests on the hands of Luffy and his crew.